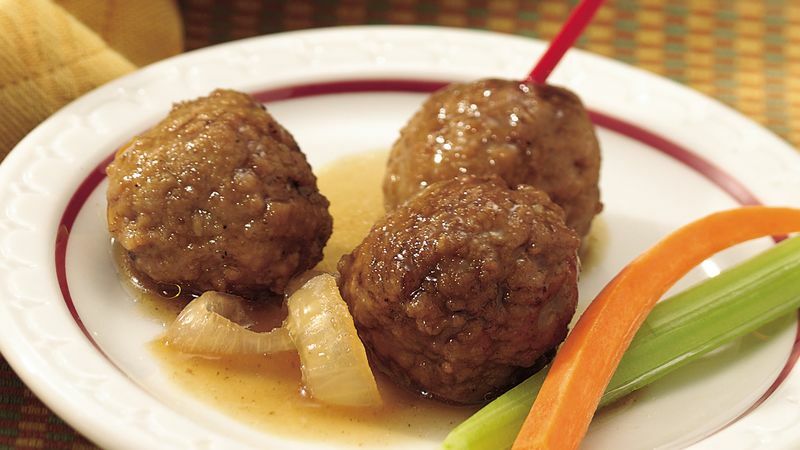 In 3 or 3 1/2-quart slow cooker, combine meatballs and onion. Sprinkle brown sugar and soup mix over beef and onion. Pour beer over top. Just before serving, gently stir mixture to coat meatballs with sauce. Serve with toothpicks. Meatballs can be held on Low setting for up to 1 hour. Use the remaining dry soup mix to season ground beef for burgers or for a pot roast. Do not lift the lid during slow cooking. Each time the lid is removed, it takes 20 minutes to bring the food to proper cooking temperature. If you have to sneak a peek, very carefully twirl the round lid, removing the condensation so you can see inside. To make Bavarian Meatballs Melts, spoon the meatballs into split crusty rolls and top them with shredded Swiss cheese. Broil the sandwiches just until the cheese melts.